Did you know that it's possible to write lyrics that actually hypnotize your listeners? You can create lyrics so compelling that they actually put your listener into a light "trance". Now, music can do this too, and the combination of "inspired music" and "hypnotic lyrics" can create powerful emotional swelling in your listeners. Have you ever heard a song that caused you to feel little" tingles" move down your back? This is the effect of inspiring music and compelling, hypnotic lyrics. In this article I want to scratch the surface of writing lyrics that cause EMOTIONAL reactions in your listeners. Let me start by saying that: Most people go about writing lyrics exactly the WRONG way. Have you ever sat with a piece of paper or at a computer, staring at the blank screen trying to think up the "perfect line" that is going to move emotion in your listeners? Common... be honest! We've all done it! So how can you write lyrics using your "creative resources" instead of your "analytical resources"? Here's the million dollar tip of the day. To create truly spellbinding lyrics, you have to "kick" your inner "editor" out of the room. Instead of JUDGING everything you do, you need to let ideas pour out of you WITHOUT judging them. 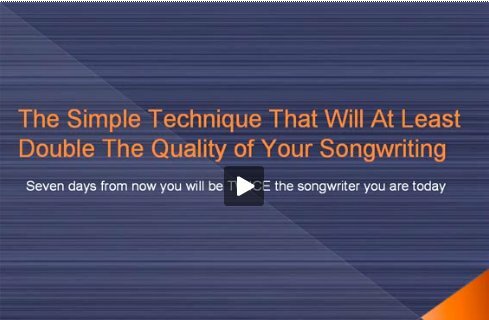 Here's what you need to do when you want to write lyrics. In a later article I'm going to send you some specific tips about WHAT to write about, but for now, just choose something. I know you've got some ideas spinning around inside your head! Sit in your comfy chair and write lyrics completely unedited for 20 minutes. Don't worry about making mistakes. Don't worry about not "completely nailing" every line. Don't worry if you think you're writing rubbish. Write everything that comes to mind. Do anything to keep your pen moving. After completing this session, have a short break. Do something fun! Make sure you take your mind off the task of lyric writing though. When you come back you will notice something very strange. This writing that you've just done... it flows much more naturally than any lyrics you've written. And as you go through your writing, there will be certain lines that jump off the page and GRAB you. These are the lines you can use as hooks and focus points of your song. Ok... this is just the start really. But by now I'm sure you can see that writing completely unedited defeats the problem of staring at a blank screen (or blank piece of paper). And it also has allowed you to produce some of your most natural sounding lyrics to date. In a later article I'm going to give you some tips that will really make your lyric writing hit home. With these tips you will be able to take what you've done in today's exercise, and polish it until it literally moves your listeners to tears (or joy depending on what you're writing about!). I want to leave you with one more thought. Why is it possible to write lyrics that move people emotionally? And I'm talking about JUST the lyrics. If you take away the music, the melodies... everything until there's nothing but the lyrics. Here's the answer: Something in the lyrics triggers a memory in the listener that has emotion attached to it. This memory could be anything. It could be a past memory. It could be something they've dreamed about. It could be something that they've fantasized about. If something in your lyric can cause your listener to reflect on an "emotion filled" memory, than they will feel the emotion attached to this memory. This is why love songs or songs of "lost love" have been so popular over the years. Most people have at least some experience in this area, and since being in "love" is very emotion driven, lyrics to do with "love" can cause a listener to re-live this emotion. If you want the "advanced training" so you can develop incredibly powerful lyrics that move people, be sure to check out my book, The Songwriting Genius Within You. There are many original ideas in this volume that will lift your lyric writing to new, soaring heights. There is one technique in particular that will blow you away. This technique really taps into your "hidden genius" and is an incredibly pleasurable way to write lyrics. Get your copy at this website.